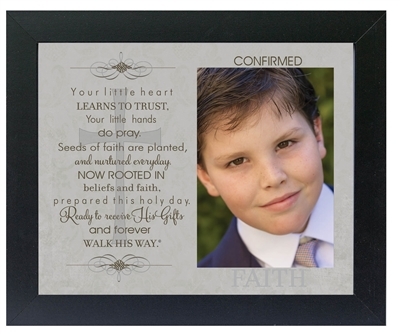 Handsome Confirmation gift for young girl or boy. Our 8x10 Confirmed frame can be displayed on a wall or table and is available in a white, black or silver frame to suit any decor. A beautiful sentiment about growing in faith sits side by side with the child's special day photograph. The frame holds a 4x6 Confirmation day photograph, a wonderful keepsake and inspirational memento from the day.